The Torbay Hospital League of Friends was set up in 1954 to provide amenities and services to support Torbay Hospital. A Coffee Shop and drinks facilities in the Outpatients Department and other waiting areas throughout the Hospital. Voluntary Guides for patients visiting the various clinics. The League is able to enhance what the Trust provides, by purchasing 'extras' to provide the most advanced methods of treatment, for benefit of local people and staff of the hospital. 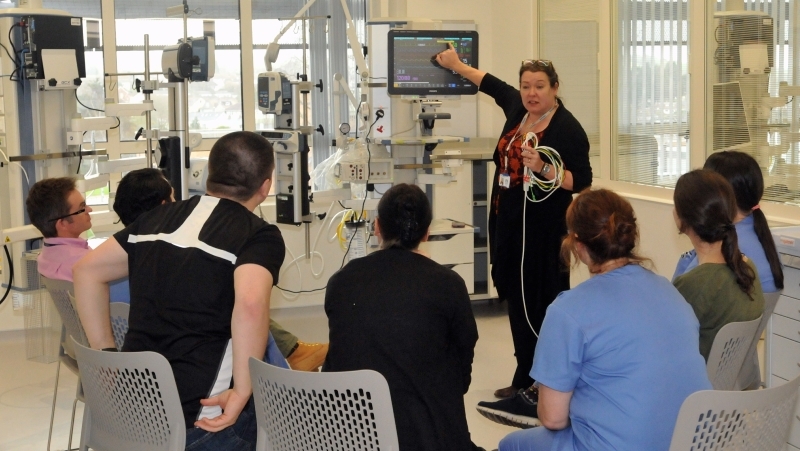 The picture below shows Critical Care Unit staff being trained on new equipment funded by the League. The first hospital to be built in Torquay was a voluntary hospital. It was built with voluntary contributions and maintained by voluntary contributions. With the introduction of the National Health Service in July 1948 all this voluntary help disappeared until early in 1954 when a few people got together and decided that there was still a need for voluntary help for the hospital. The League started in a small way with the gifts it provided but as the membership increased with the corresponding increase in income, it was able to take on larger items such as television sets, modern beds, lockers, cubicle curtains around beds and later, day rooms where patients could sit in comfort on all the wards in the older part of the hospital. Since then the League has provided many large items of equipment ranging from a few pounds to more than a million pounds, helping to fund evverything for comfortable benches to major new buildings and facilities. We are delighted to have been honoured with the Queens Award for Vountary Service in recognition of this work. We celebrated our Diamond Anniversary (60 years) in 2014 by launching one of our biggest ever appeals and successfully raised £1.6 million for Torbay Hospital's new Critical Care Unit. Donations came from individuals and organisations, from legacies and pennies in collecting cans. A very significant contribution of £300,000 was received from the Paignton Hospital League of Friends, recognising that the new CCU benefits the whole of the wider South Devon community. 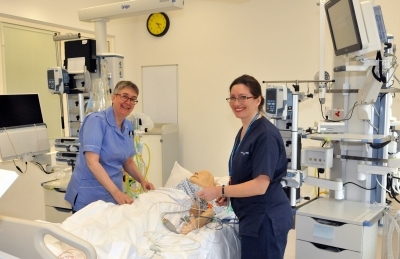 Our picture shows staff training with the new equipment in the days prior to the opening of the new CCU. The ceiling mounted arms carry all monitoing equipment which can then easily be swivelled and moved to allow staff to tend patients withouth shifting trollies and cables.